We know your shih tzu is a furry little angel, but not all food and drink establishments can contain the glory of your freshly groomed pet. 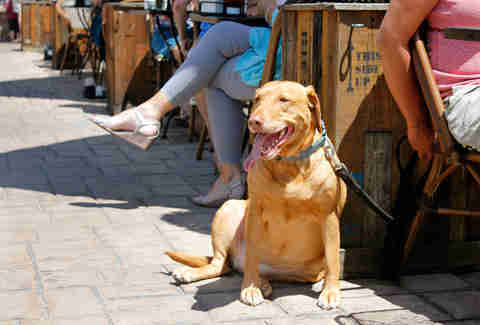 When it comes time to party without leaving your dog at home, turn to any of these eight bars and restaurants where they’ll be treated like a VIP -- Very Important Pooch. 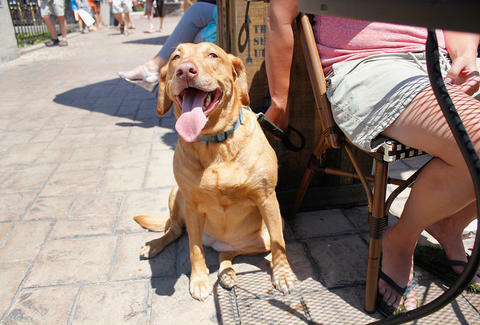 Dogs are welcome on the large, street-side patio of this bar and restaurant. There’s a stack of red dog bowls to keep your pooch hydrated and the friendly servers may even offer Fido a big old treat. It’ll keep him distracted enough to ignore the people walking through the patio on the public sidewalk, so you don’t have to keep tugging at his leash. Humans like The Backyard because it’s got fire pits, cook-your-own-meat grills, and a giant projection screen, but dogs like it because it looks like a doggie wonderland. The big fenced-in grassy yard and presence of other dogs may make it seem like a dog park to your four-legged friend. A dog park that serves beer is a beautiful thing. 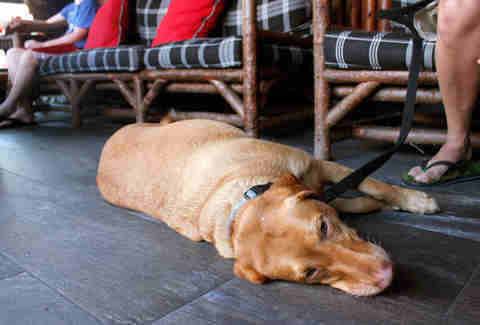 A trip up north wouldn’t be complete without your dog, so naturally your dog should come hang with you on Camp Bar’s two-story patio. He’ll get ear rubs and dog treats from the staff, but if he’s really lucky you’ll share the garnish from your old fashioned or Bloody Mary. Hanging out on the lakefront in the sun can be tiring for both dogs and their humans. 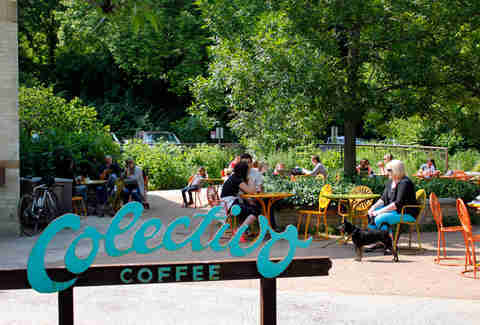 Take a break on the lush patio at Colectivo, a locally loved coffee shop that offers substantial sandwiches along with the usual baked goods and caffeine. 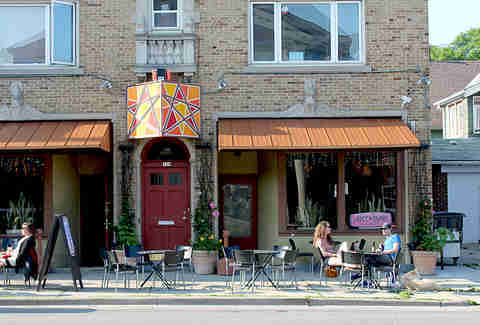 Art*Bar is the embodiment of Riverwest: it’s eclectic, it supports local artists, it’s kitschy, and it’s got beer. It’s also one of the few bars that allows dogs inside, where they get tons of love and attention from the staff and other customers. 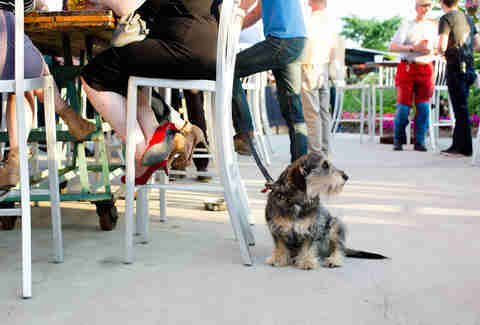 It’s so well known as a dog friendly bar that perhaps they should considering renaming the place Dog*Bar. 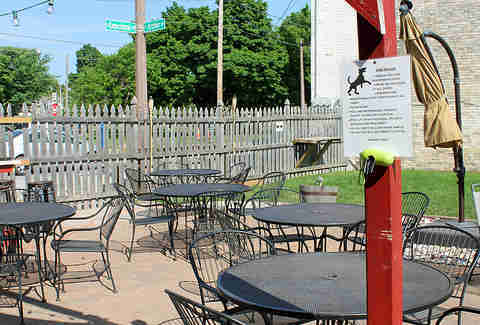 Hollander, right in the heart of the Tosa Village, has an idyllic patio on a bridge over the Menomonee River. Because it’s such a busy pedestrian thoroughfare, it’d be hard to ban dogs, so instead Hollander embraces them. Pooches get a water dish so they can relax while mom munches on a banana coconut pancake brunch. 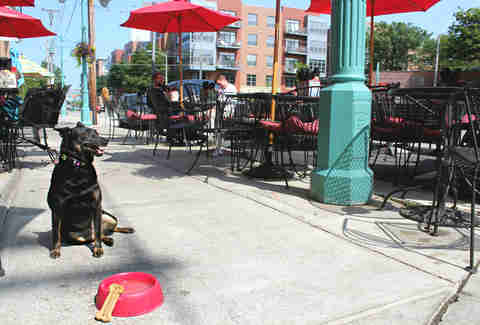 Dogs are treated like regulars at this bar on Brady Street -- some even sit on barstools. Bartenders are quick with treats and there’s a communal dog bowl of water in a corner near the neon sign touting Miller High Life specials. I can only imagine how many dogs have had their first taste of beer here, lapping a spill up off the floor. The Iron Horse is a pet-friendly hotel, so it only makes sense that dogs are also welcome in the lobby and the outdoor patio area, The Yard. Treats and bowls are readily available for parched pooches. And if you’re staying in a room, your doggie can get VIP treatment complete with fluffy dog beds and a room service menu just for pups. Lacey Muszynski is a Milwaukee writer who would like to thank models Lexi and Scarlett (and their humans), and Leah at Roman Coin for entertaining Lexi. Follow her on Twitter @worthhersalt.